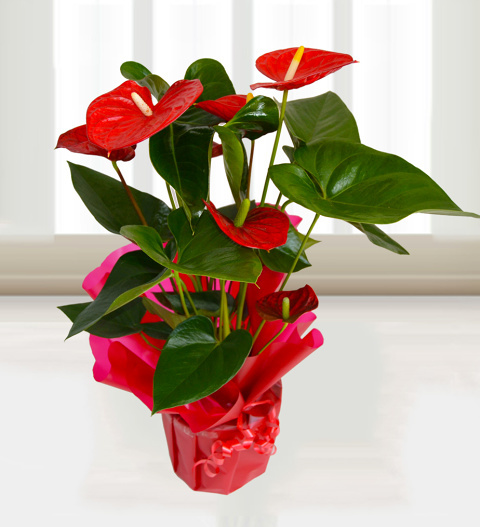 Anthuriums are the picture of exotic beauty. Their brightly-coloured flowers are wonderfully hardy as are the perfect, green leaves. The contrast created between these shades of red and green makes the simple beauty of these plants even more dramatic. The next time you want to brighten up your own home or send a floral gift to a friend, consider this captivating beauty. Available for UK next day delivery, this plant is perfect for when you need a thoughtful gift at the drop of a hat. Chocolates may contain nuts.